In this paper we discuss current research and theories on the relationships of role models, possible selves, and gender in order to discover whether the use of role models increases attraction to and/or success in academic fields stereotypical of the opposite gender. Academic areas such as math and science are typically male-dominated; however, does the awareness of role models, specifically female role models, increase a woman’s possible self-views and decisions to participate in an atypical feminine academic filed? Current research suggest this to be an accurate assumption; further research is required in order to determine what causes women to avoid male-dominated fields, and to the imagining of themselves as being successful or proficient in these areas. 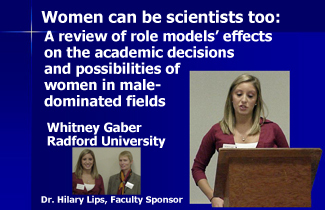 An overview of Whitney Gaber's slides is available. In order to access the index to her slide presentation, click on her image above or here (slide-index).